As we sometimes see in the 16-bit era, first party published titles became interesting exclusives on either side of the console wars and among the various Spider-Man titles I have to say this is my favorite. Amazing Spider-Man vs. Kingpin (or better known on all other ports as Spider-Man) tasks you with defusing a bomb set by the nefarious Kingpin within 24 hours (pretty sure that’s not real-time) by collecting keys from different foes in the Spider-Man universe. This was the first game I played that gave me exactly what I expected out of a superhero title. 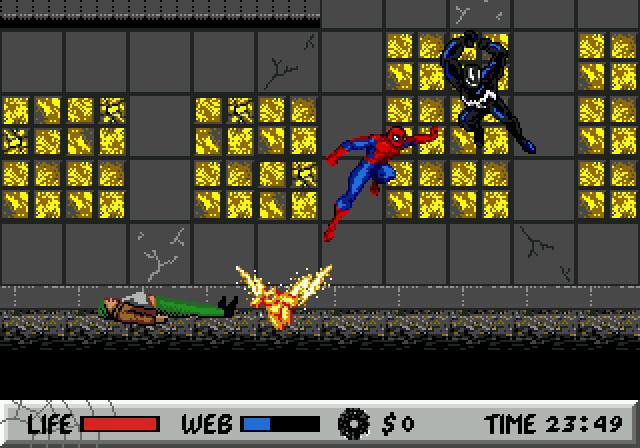 It allowed me to play as Spider-Man, it had solid controls that included web slinging and wall grabbing, and it did it all in a side scrolling platformer/brawler. Not only that, but the game embraces a non-linear structure where you visit locations throughout the city and face whatever is in certain locations, which felt like it freed the game up to your personal pacing, something quite uncommon in the days of early platformers. While the plot centralized around the Kingpin, you will take on almost all of Spider-Man’s key foes including Venom, Doc Oc, Lizard, and Electro, just to name a few. Graphically the game had that semi-real grit that Sega titles all seemed to offer in the early 90s with great animated storyboard art throughout.